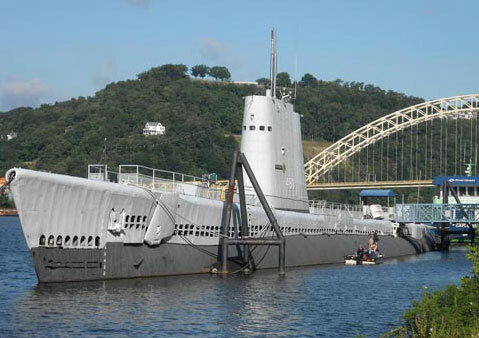 Welcome aboard the USS REQUIN home page. This site includes historical photos and information, ship's history, and information on REQUIN's current status as one of the most popular attractions of the Carnegie Science Center in Pittsburgh, Pennsylvania. I am currently conducting more research for a subsequent edition of my book "REBIRTH OF A SUBMARINE: A HISTORY OF THE USS REQUIN (SS-481/SSR-481)". For a status of this, contact me via e-mail. This page is dedicated to those who rode REQUIN throughout her years of service in the United States Navy, but especially to the memory of M.H. "Tink" Garlock, who died aboard REQUIN on September 21, 1962. No unauthorized reproduction or duplication of the text or photographs allowed without written permission from the author.